This past September T-Mobile launched one of its most aggressive promotions with the “Kids Are Free” family plan promotion giving you the ability to add up to 3 people to your Family Plan account for free (until January 2012) with a qualifying rate plan. 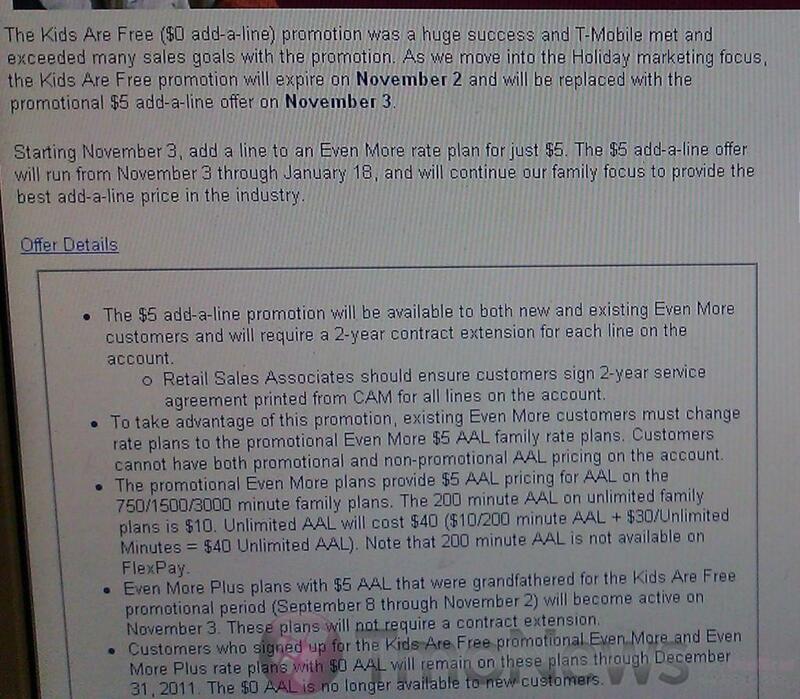 Well today is the last day of that promotion and beginning tomorrow, it will be replaced with a $5 add-a-line offer. Starting tomorrow, customers with Even more rate plans will be able to add an additional line for only $5. The $5 add-a-line promo will be available to both new and existing Even More customers and will require a 2-year contract extension for each line on the account. Qualifying rate plans include the 750/1500/3000 minute Family Even More plans but of course the unlimited plans will not qualify. ← T-Mobile Adding Data Plan To New Data Lineup? This promo was BS if you ask me. Because its $0/line the first 12 months, then $10/line. Or you can just get the $5/line forever. No, it does go back to $10 after the promo period. It was a good deal to get people in, and FREE always sells, but yes, the $5 add-a-line is the better deal in the long-run. Thanks for the update. I just called and switched over 2 lines. Now saving 10 bucks a month! I bet somebody gonna Sue cause it didn’t go til 2012.
lol. sue because it didn’t go til 2012? lol if you sign a contract, it’ll continue to be $0 until 2012. You idiot.